Make profit on contractors, media, and more. Learn how to re-sell your external expenses to your clients. In some cases, the project budget is created neither by estimating hours, nor by retrospectively invoicing the time spent on it. Sometimes the profit is made by a simple difference between the buying and selling price. You’re a production agency managing an event – you rent the premises, hire the photographer, arrange catering, etc. Your salary is included in the profit margin that you generate from re-selling the individual items. The 3rd step of creating a project can be skipped, as there will be no costs generated by tracked hours. Skip the step by clicking the Skip button. 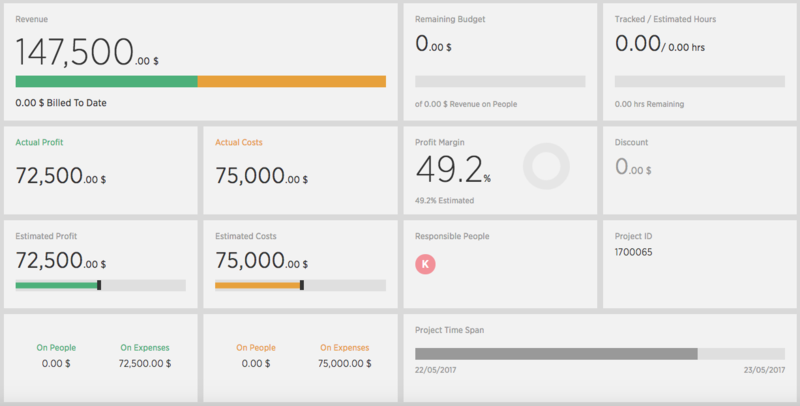 In the 4th step of creating a project (Project expenses), enter the individual external costs. This procedure will ensure that you’ll always see how much profit you’re generating within the individual items (Total). When finished, you’ll be taken to the project page (Overview), where you’ll see the current financial status of the project.